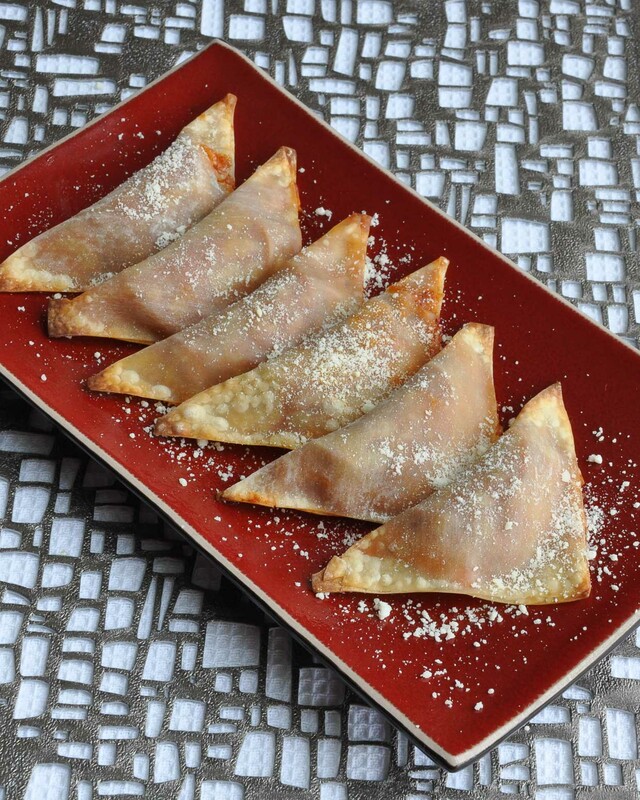 Make these Homemade Pizza Rolls and take the sketch out of snacktime! Crispy baked won-ton wrappers make the perfect base for bite sized pizza poppers. Oh pizza rolls…. Though I probably watched TV a total of 2 hours this week, I’ve still managed to see no less than 50 commercials for uber-processed Pizza Rolls. UGH! Really!? Growing up, my parents worked around the clock and often left my siblings and I with a freezer stocked to the brim with Bagel Bites and Pizza Rolls. It happens. But not anymore! Despite kicking the habit when I went away to college, those commercials hit me with some serious nostalgia and some mondo cravings. Then, as usual, twitter pushed me over the edge. Shame on you Totinos for not only making this crap, but for marketing it to kids and parents. Sometimes… when I’m feeling particularly feisty, I daydream about making “Eat at Your Own Risk” stickers and slapping them on every product in the grocery store that labels sketchy products food instead of food-like products. Grr! *End of rant* High-Five if you’re with me! 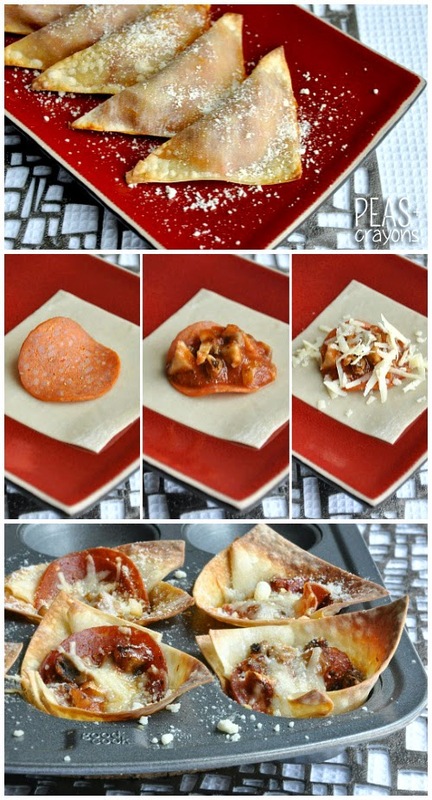 I saw this awesome skinny pizza wonton recipe Dashing Dish and decided won-ton wrappers were totally the way to go! Plus I almost always have wontons on hand for speedy snack creations. I apologize in advance if you end up with a won-ton wrapper addiction too. LOVE THEM SO! These easy cheesy homemade pizza rolls are a home-run snack! They can even be made two ways! Roll them up into little pizza roll pockets or opt for the super-quick option of making little pizza wonton cups and stuffing them with all your favorite pizza toppings! Hellooooo deep dish pizza cups! 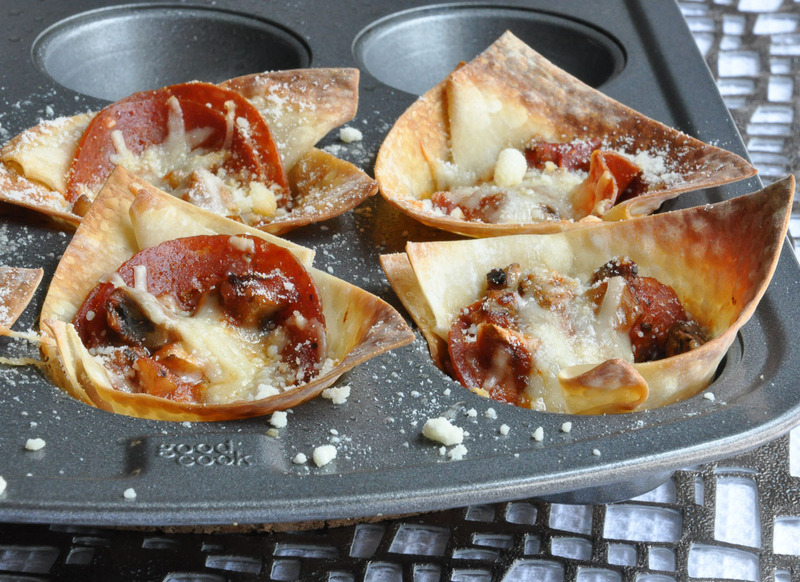 To make pizza cups, spray a mini muffin pan with olive oil and line it with a won-ton square. Fill with all you’re favorite pizza ingredients and toppings and bake at 375 degrees F for about 8 minutes or until deliciously golden brown. If you only have a regular muffin pan, you might be able to mickey mouse it by using two wonton squares to make your cup. get creative! Take your favorite pizza toppings and go nuts. You can whip these up Hawaiian style meat lover's, veggie lovers, or simply clean out your cripser with this super versatile snack! If you're a mushroom lover like me, start by sauteing a handful chopped mushrooms with a minced clove of garlic in olive oil. If you can't stand the stuff, skip it or swap for some delish diced peppers, onions, or even some Italian sausage crumbles + follow the steps below! For sketch-free pizza rolls, lay your won-ton wrappers flat on a cutting board. Add just a teeny bit of sauce so it doesn't squish out the sides. Top with veggies and pepperoni a la the photo below. Dip your finger in a little bit of water [keep a small cup handy] and run along the right and bottom side of the square and press closed until sealed. The water helps them stick. When all your pizza triangles are sealed, set atop a wire baking/cooling rack and spritz each side with spray oil. Place the wire rack on a baking sheet and bake at 375 F for about 8-10 minutes, until golden and crisp. Want your pizza rolls extra saucy? Feel like skipping the whole folding shenanigans? 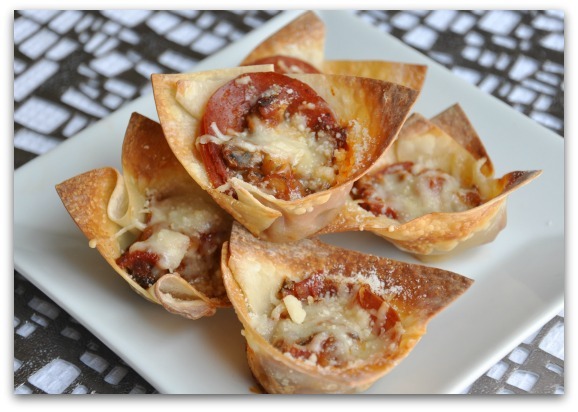 See below for steps on how to make deep dish won-ton cups in mini muffin tins! They're easy and equally delicious! If you get a chance to try these homemade pizza rolls, let me know! You can leave me a comment here (LOVE checking those daily!) or tag @PEASandCRAYONS on Instagram so I can happy dance over your creations. I can’t wait to see what you whip up! Also, turning the rolls into cups… nothing short of amazing! More pizza. Same crunch. #Jackpot! Prep, freeze on a flat baking sheet, toss into a baggie and store in your freezer for later! I made these pizza cups recently for the um-tennth time and they were delicious, as always. This time I made a few different kinds in the same muffin tin. For the toddler I did just sauce, cheese, and pepperoni. For myself I added in some green peppers and onions. For the husband I did all of that plus leftover sauteed hot Italian sausage crumbles, red pepper flakes, and jalapeños. It was easy and I was able to make enough to fill up the husband, which is hard to do with quick meals. Thanks for another great recipe! So so happy to hear it Shauna, thank you! Love all your fun variations! I made 252 of these today to freeze for the kids snacks this summer. I made pepperoni pizza with pepperoni, Mozzerella cheese, parmesean cheese, garlic, red pepper flakes & pizza sauce. I made philly cheese steak with steak, sauteed onions, bell peppers & mushrooms, Worcestershire sauce and Mozzerella cheese. I made veggie pizza with sauteed onions, bell peppers & mushrooms, Parmesean cheese, Mozerella cheese and pizza sauce. I made cheese pizza with Parmesean cheese, Mozerella cheese and pizza sauce. I made barbecue chicken with barbecue chicken only. When I get more wrappers I am going to make ham & cheese; pineapple, pepperoni & cheese pizza; taco; bacon cheeseburger; triple meat pizza and some other kind that uses steak because I have a steak leftover. These are turning out AMAZING! Thanks for the ideas! Holy cow! Now I need to add these to the menu again so I can try out some of your ideas! They all sound so good! Roberta you’re my hero! So stoked you’re loving the recipe and I’m excited to try all your fun twists out – AMAZING! 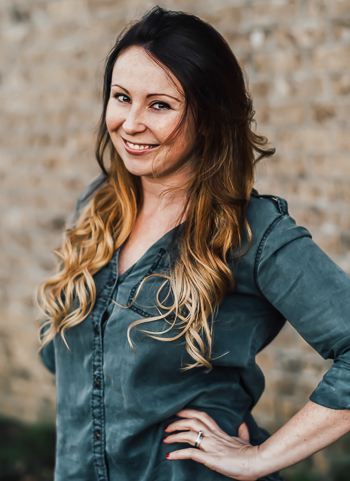 I just did my 15th WIAW post, so I’ve been following your blog for roughly 20 weeks (missed a few WIAWs along the way). I happened to stumble upon this post tonight and can I just tell you – I know we barely know each other – but I just fell in love with you! Seriously my fiance and I LOVE pizza rolls. I’m try to eat healthy and he has a hard time eating health. Once we get married, though, he’s under my power 😉 and these will be so perfect! I seriously was thinking a while back, I wish there was a way to make pizza rolls that wasn’t so terrible for you and boom here they are!!! I’m SO excited! Okay so that’s my huge letter basically saying thanks for making this and sharing it and you completely rock my socks off! My store ran out of won-tons, so I tried out egg roll wrappers. A little messier, but fantastic! I can’t wait to freeze some 🙂 Thanks so much for this wonderful idea! I’m going to try these this weekend for the Super Bowl! Such a great idea! Since you posted this two weeks ago…I’ve been jonesing to try it! But I couldn’t find the wrappers at my normal grocery supplier. I had to look up the product online to see where they sold them…and I found them tonight!! I made the pizza rolls….AH-Mazing!! Thank you so much for sharing the recipe. You’ve inspired me to start a new weekly post: Foodie Fridays. 🙂 And this will be my first “episode”! Can’t wait to try out some of the other goodies you’ve got posted on here! YUM! And there are so many healthy options to make with these! I love that you can freeze them also!! I am going to make these next time my husband invites people over to watch sports. Damn you won-tons for not being gluten-free. I like feisty Jenn. She’s hilarious. I grew up on that processed crap too. I blame my mother. Yum!!! Those look seriously amazing. I am with you on the eating better foods, but I must admit that once in a while we totally eat totinos pizza rolls. But I suspect that if I make these, they will quickly become a replacement! I’m seriously drooling over here! Liiikkeee OMG! They look absolutely delicious! You are awesome! Yes!!! I am so excited about this! I love those stupid pizza rolls so much so I am SO excited to try this!! Yum! hehe thanks Errign! I’ll recipe test freezing techniques this week and keep ya posted! SO going to try these! I LOVE pizza rolls and so does the hubs – a healthier version is fabulous!! I’m so trying these- not because I’m a huge fan of them myself (I’m a bagel bite girl), but because my son eats these in mass quantities. These look not only healthier and yummier, but even more budget friendly. Rock on. These look incredible! 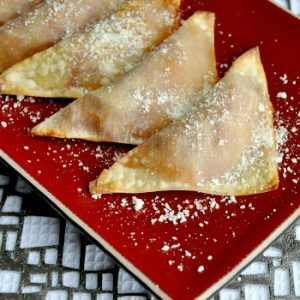 I tried to create “italian wontons” a few months ago, but these look so much simpler (and healthier, as I hadn’t figured out the baking part when I was doing my experiment. Can’t wait to try them! good gaaaah those look d-lish! i think you’d have a hay-day in our freezer section, those stickers could come in mighty handy i’m embarrassed to say ; ) as my soppy bit of yogurt stares me square in the face, i’ll have you know i’m now dreaming about crazy awesome pizza inspired escarpments like these. cheers to rad revelations and happy Sunday! *HIGH FIVE!! * I can just see us now skipping up and down the aisle with our stickers in hand! hahaha! I should have known that the won-ton wrapper train would make a stop here! I LOVE it! I practically LIVED off pizza rolls and cold cereal when I was in college! If only I had known about THESE back then! Ohhh, and I love the deep dish version! Preeeeeeeeeeety! This is amazing! Brian is crazy for just that kind of packaged, not-real-food-I-never-eat-it-and-never-will type of snack. And he’s so sad that I refuse to let it in the house. I have a feeling this is going to make both of us happy. Did you try freezing them? Does that work? Because I think making a million of these and having them in the freezer ready to go would be delish! Those look fabulous 🙂 YUM! Freakin’ a, girlfrien’, these look delicious. 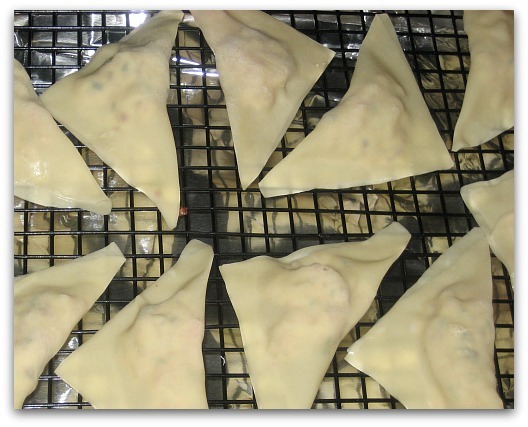 Since you’re a wonton wrapper goddess and all, do you know if you can freeze leftover ones?! Hahaha!! I love pizza rolls – and seriously, this recipe is amazing! Thank you for sharing! I’m obsessed with those dang pizza rolls. This recipe is now bookmarked, cant wait to try it! Its so awesome when you re create something healthier and tastier than the original! Those look fab! I look at the wonton dough almost every time I’m a the grocery debating what I could do with them and always put them back…I’m getting them next time! This sound like an instant hit! These looks something scrumptious!! I try adding goat cheddar or maybe daiya to make it cows milk free, but I think they will still taste as divine as yours look!!! AWESOME!! Genius. I’ll be making the cups since I’m all about the crisp! I’ve never heard of pizza rolls either but these look divine. They’d totally hit the spot and I bet my 6-year-old would love them! I’ve never heard of pizza rolls but these look amazing! I never get to eat pizza because my boyfriend hates bread, cheese and tomatoes (What a freak, right??) so i could just make a couple of these just for me…. perfect! These sound phenomenal!! I should totally try making them vegan. Yummy! I am looking forward to trying them. ughh i totally agree on the supermarket frozen “food”! Sometimes I can’t believe my parents let me have Bagel Bites…theres nothing in them but sodium and like…a ton of chemicals?? grown-up me only eats them when I’m drunk…lol…but YOURS look amazing!!! there’s so much different stuff you could put in them! making normal pizza can get kinda boring sometimes, I’m gonna have to test this one out! YUM!!! I would totally eat these RIGHT NOW…if you were here to make them for me. Hahaha. I haven’t had pizza rolls and bagel bites in forever!! These sound and look absolutely AMAZING. But I’m not surprised, since most of your recipes seem to follow that route. I was big on Bagel Bits and Pizza Pops when I was younger, too, but I’d take these over that stuff any day! well aren’t you creative! that looks and sounds AMAZING! a lot of work though…well for me. haha. i’m lazy. Siobhan @ sio 'n the run. How creative are you?! I love it! I’m gonna have to make these for my next party! Thanks for sharing this you lovely lady! Love the cup idea, because I am not good at the wontons. They bleed out the seams on me. Every time. Either way, this looks super yummy! Oh my God. Give me some! I think we need to nickname you the Wonton Queen! Another great recipe girl!! omg omg omg !!! These look amazing. I love your wonton recipes!! Have a great weekend lovely! Yum that looks so good. I need to go and make it right now. Along with all the other won-ton ideas you have!!! When I was younger, I was never really into bagel bites. I was all about the TGIFridays cheese sticks. OMG those were good. Little miss hemp seeds, you are SO creative! You’re my dressing/sauce guru! I can keep a secret =) Meet ya 1/2 way? Ohhhhh these look good. Yes, please!! I am totally making these for my hubby tonight! I am going to try it with puff pastry though, because I have some in the freezer! I want YOUR pizza rolls, but in a box like the “not so good ones” that I can easily heat in my ancient microwave… I’m feeling Friday-lazy. you are so crafty! hahaha love it! How terrible is it that we ate the food-like pizza rolls in the last month? I blame the coupons. They sometimes make me buy crazy things, when they’re free! 😉 But your version sounds so much tastier (and, duh, tons healthier). I bet I could make a big batch of these, refrigerate or freeze them before cooking, and then pop them into the oven after a long day of skiing. They would be such a hit! Just wanted to let you know you may just be my HERO! oh yum! pizza rolls are just too good. loving the healthy alternative! You are the poster child for wonton wrapper innovation! So cool! I’m make mine with jalapenos, cheese, and salsa. Jalapeno pop-ton!!! I totally ate them that often too. Pizza rolls and sour cream. It was one of the biggest food addictions of my childhood! ooh I bet if you steamed them after stuffing them it would make fabulous dumplings for soup in the winter! i love using won ton wrappers. we buy that faux pulled chicken and stuff them in the won ton wrappers and bake, kind of like baked mini tacos. delish. I’m going to go buy wanton wrappers now. not gonna lie, i love pizza rolls, too. this is genius! Girl these look AMAZING! 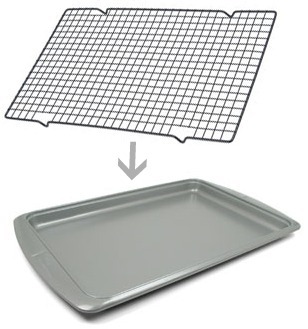 I love the cooling rack/baking sheet thing – I do it all the time! High five!!! I love this recipe! My kids have never had pizza rolls but they love when I make bagel or english muffin pizzas! They will love these, and so will I!! High 5 times 10, Jenn! Love your sticker idea!!! Those pizza rolls look so yummy. 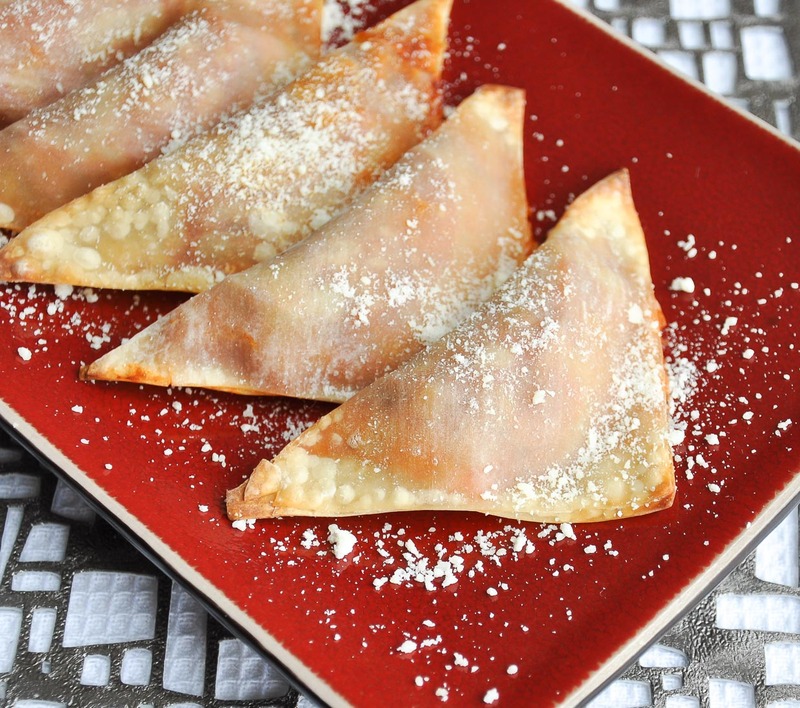 Your pizza wontons look a trillion times more appetizing than Totinos! Yummmmmy! I used to tear up some pizza rolls, haven’t had them in years!! These sound even better…adding these to my “must make” list! Thanks for sharing! Good Call! I’ve definitely eaten way more than my fair share of bagel bites over the years. They’re SO QUICK and easy I bet your little chefs could help make them! So excited to see more of your RAW eats again! You’re so inspiring! These sound amazing!! I’ll have to bookmark this. I know Michael will love them! omg my parents ALWAYS had popcorn and pizza rolls in the house..and now i want that for dinner. A LOT. h rarely lets me eat that for dinner tho…which is good bc that stuff is pretty deadly. i like this recipe! Those look amazing and I am going to have to try those on my kiddos. the one thing I constantly crave is pizza. delicious fantastic awesome pizza. these look great, girl!